Xbox LIVE Indie Games had this promise when it started, that budding developers would get the chance to make games that we’d never played before. Having played 7,455 twin stick shooters since then, it would seem that much of that promise has gone missing. In a way, Doc Logic is just a 2D platformer, but in other ways it’s unlike any other 2D platformer and the kind of game that the service is made for. There’s no real “end” to the levels in Doc Logic. They either end when you’ve run out of time (and lost) or collected enough collectibles (and won). Either way, you’re running forwards and backwards in the same small level, covering the same ground. The goal is to reach level fifteen. This is done by collecting, er, collectibles. Each one adds a few seconds to the clock and each fifth one raises the level. As the level goes up, you’ll be faced with ever stronger and more numerous enemies, and the level will expand in size as new areas open up – either horizontally or vertically. You can’t die, and while this might sound like it makes the game easy, it’s anything but. Doc Logic is actually very difficult indeed. Or I’m rubbish at games. I think it’s probably somewhere between the two… it is hard though. Each time you’re hit by an enemy, you’ll lose five seconds from your time and can carry on until that time runs out. 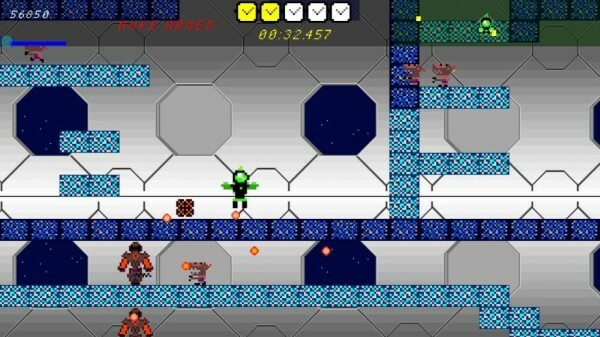 Beyond level ten things start to get very hectic, with enemies everywhere you look and swarming around you, navigating the level to find the collectibles suddenly gets far harder. There is some help available. Your pathetic jump and weak melee attack can be powered up by collecting enemy drops, and you can go through a series of evolutions until you’re speed, jump, and gun are all amazing. There’s a nice balance though, because you’re never too powerful, that extra speed brings with it disadvantages in that it can be much harder to evade enemies. You also have a shield which protects you for a short time, and in very rare instances you’ll find a Nuke which can be activated with RT and kills every enemy on screen for massive points and carnage. If you don’t need it, holding down RT will give you the maximum evolution of your character, allowing you that speed/jump/fire boost instantly. There’s a whole ton of stuff to weigh up and the balancing act the player has to perform is almost as difficult (is it?) as the game itself. Stage progression is unique, too. To open new stages, the player has to reach a certain “level” in the previous stages. Reaching level 12 in the first two stages will unlock a stage that requires 24 levels to unlock, for example. Only your highest score is counted towards this total, though, so unless you’ve reached level 15 there’s a constant feeling as you play that every level counts, and replaying stages to go that one level further is quite addictive. Each stage has its own layout and a new tune from 8-bit Weapon, and it’s worth playing through for the music alone, even if the gameplay itself wasn’t excellent. The gameplay is excellent, though, and the feeling that you can always go just that little bit further than you went before gives the game plenty of replayability… and if it doesn’t, there’s always the harder mode. Doc Logic is available now for 80 Microsoft Points.